Formal lawns are usually sown in fine-leafed grasses such as browntop (Agrostis capillaris) and chewings fescue (Fistula rubra commutate), which spread sideways across the ground surface and form a dense mat. Playing fields are similar to lawns but usually include species, such as ryegrass, that can withstand trampling. Bowling greens are usually sown in browntop or, as in this example, cotula (Leptinella dioca), a small native herb that forms a very compact mat. 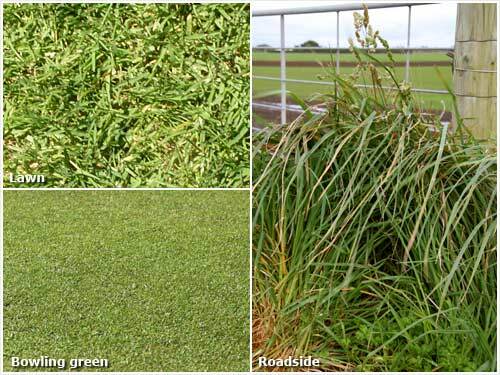 The species that are commonly found on roadsides are usually tall, erect grasses, since they are not generally grazed or cut. Cocksfoot (Dactylis glomerata) and buttercup (Ranunculus repens), as shown here, are often found.